The town of al 'Urr lies in the heart of Yafai, a tribal and geographic delineation. Yafai as a region used to be part of the Democratic Republic of Yemen, the socialist country that merged with the Republic of Yemen in 1990 to form Yemen as it exists today. Many of the Yafai, as a people, are loyalists to the southern cause in the 1994 civil war that, in their view, has not ended. Tensions between the Yafai and Republican Guard forces, stationed at a nearby base, erupted into gunfire in late April, and skirmishes continued until May 1. On May 2, the Republican Guard forces withdrew from al 'Urr. Video posted to YouTube shows tanks rolling out of the area under white flags made of undershirts, as villagers chant "leave" and "the people want the fall of the regime." 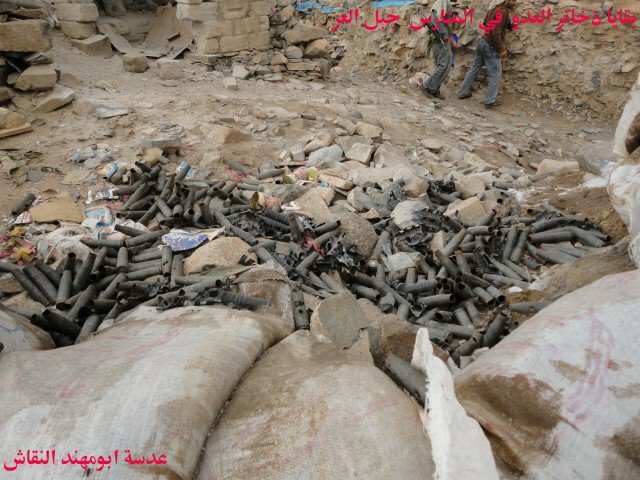 Yafai tribesmen plundered the empty base for munitions left behind. Pictures show piles of spent bullet casings and Yafai tribesmen climbing over an abandoned tank while one man holds a homemade Democratic Republic of Yemen flag. On the morning of May 3, the Yemeni Air Force bombed the base. PressTV reported three dead, while the Yemen Rights Monitor blog counted eight injured. The bombing at al 'Urr was the first Yemeni airstrike since the turmoil began. The government could have justified it as a government strike against its own evacuated base to prevent the seizure of war materiel by non-state actors. It could have been an isolated incident, and it was until a week later, on May 10, when members of the Nihm tribe tried to block a tank column from proceeding toward Hadhramaut, where protesters and rebellious tribes had gathered. Skirmishes broke out, and the Nihm tribesmen were also bombed. Since February, the faltering regime of Ali Abdullah Saleh and the Yemeni opposition movement have engaged in a long, slow war of political attrition. The opposition has gradually gathered defecters from Saleh's government and political party, while government-loyalist forces have attacked protesters with tear gas, anti-riot rounds and, increasingly, small arms fire to whittle away morale. So far, the toll is estimated at approximately 170 deaths, but may be significantly greater -- Yemen's Sahwa Net news reports that the Saleh regime may be stealing the corpses of protesters and burying them in secret. The battle for Yemen's future is a stalemate and both Saleh and the opposition know it. Since the beginning of May, both have responded in the time-honored tradition of stalemates: they've begun escalating. In Tagheer Square, Sanaa, opposition leaders have established an escalation committee to formulate non-violent means to increase international visibility and to pressure the remnants of the Saleh government. So far, this has meant expanding the 24-hour protest camp and instituting a civil disobedience campaign to close businesses in the capital, as well as expanding such efforts in the cities of Ta'iz and Aden. On Monday, protesters began a hunger strike. A march on the presidential palace is being planned -- it was initially scheduled for Tuesday, but has been postponed. The protesters in Yemen's major cities have been peaceful; in Sanaa, opposition leaders even set up checkpoints to screen incoming ralliers for concealed weapons. In the capital, bullets have been traveling only one way, many of them fired by plainclothes thugs or members of the Republican Guard forces commanded by Saleh's son, Ahmed. In Yemen's rural areas, however, opposition groups have been more violent. The Southern Mobility Movement, an umbrella organization of opposition groups advocating the secession of South Yemen, has been attacking the government presence in the region for several years. These attacks are escalating, as is the Saleh regime's response. Saleh's escalation is not limited to bombings in rural areas -- he is targeting urban protesters as well. On Wednesday, May 11, loyalist forces opened fire on protesters in Sanaa, Ta'iz and Aden. While small-arms fire has killed protesters on a near-daily basis over the past several weeks, this attack seemed different. Jeb Boone, one of the only English-language journalists still in Sanaa, told WNYC's Leonard Lopate that the attack appeared more coordinated than previous violence, suggesting a planned and communicated action between ground forces, riot control trucks, and rooftop snipers. 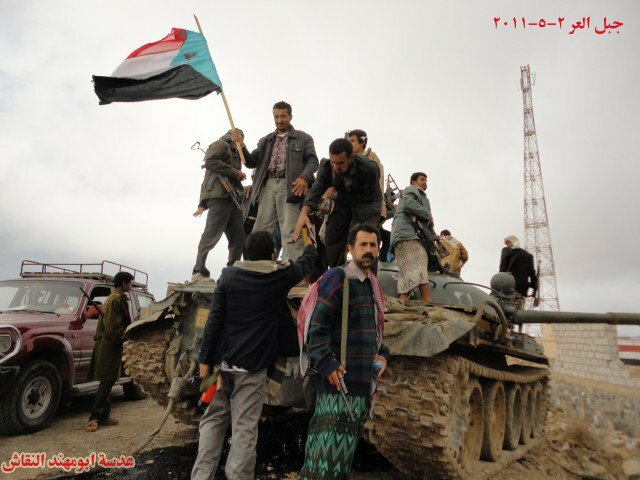 In another significant move, forces from First Armored Division, which defected to the opposition in March, arrived at the scene to press back the loyalist forces. While it is not the first armed exchange between the loyalist and opposition soldiers, it is the largest and bloodiest. Eighteen protesters were killed and hundreds wounded, including 25 soldiers. Saleh's strategy of escalating violence suggests that he is desperate. He has few options left. His forces are stretched thin after the defection of his most senior military commander, Brigadier General Ali Mohsen al Ahmar, as well as the First Armored Division under Ahmar's command. Saleh has at his disposal the loyalist forces of the Republican Guard and the Mountain Brigade, under the command of his sons, and elements of the air force and special security forces. But even this is shrinking; on Monday, May 16, 100 Republican Guard soldiers defected to the opposition. If he feels that he has no choice but war, Saleh's strategy will likely rely on air power -- with the bulk of his army gone and his remaining ground forces focused on protest cities, he will have little choice if he wants to hold on. The tribes Saleh would fight are well-armed -- in video from al 'Urr, rockets and a large caliber machine gun are audible just off camera, and at one point a large rocket, possibly a Soviet Grad, is seen arcing across the valley. In a country where the ratio of guns to people may be as great as 3 to 1, the toll of an intrastate conflict would be severe.